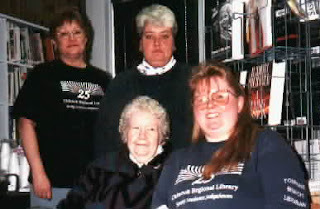 Recently a librarian named Emily Mitchell passed away. She's right there in the center of the picture. For many years she was the librarian at the Chinook Regional Library branch in the village of Tompkins, SK, Canada (my hometown). By any measurement it's a small library, but it was made much larger by inter-library loan and by Emily's presence. She helped me become a reader and encouraged my imagination to grow. I have so many fond recollections of marching the six or so blocks from school to the Chinook Library downtown and perusing the shelves, looking for my next fantastical read. If I couldn't find it, she had suggestions. And, once I realized I could order books through inter-library loan, I would approach her with such varied topics as the Roman Empire, Medieval Torture Weapons, and Norse Myths. Despite my somewhat dark choices, she was always encouraging and supportive (she was like an early version of Google, I'd ask her a question and two weeks later the answer would appear in the form of books). The library was a warm place to retreat from the cold of winter or just to get away from the outside world for a few minutes. She made it that way. Her lifelong gift to me was the love of stories and the encouragement to visit all those worlds of the imagination. Again and again. Thanks, Emily.